CLOSING DATE 07 JULY 2017, applications received after the closing date or faxed applications will not be considered. A Minimum Deposit of R850.00 is required during registration for students registering for 3 or more subjects. New students pay extra R50 for Psychometric Assessment.  Classes will only continue if a minimum number of 22 students enrolled per subject. CENTRE FOR ENTREPRENEURSHIP FOCUSING ON RENEWABLE ENERGIES SECTOR LAUNCHED. The Minister of Small Business Development Hounarable Lindiwe Zulu launched the 9th of the 10 new Centres for Entrepreneurship at Goldfields TVET College on April the 21st 2017. This is a part of an integrated Youth Rapid Incubation Model designed by the Small Enterprise Development Agency (SEDA), an agency of the Department of Small Business Development; to better service the youth start-up’s and youth owned Small Medium Micro Enterprises and Cooperatives around the Lejweleputswa District- in the Free State where the College operates. In her keynote address Hounarable Lindiwe Zulu put on emphasis that these centres are dedicated to promote entrepreneurship, venture –creation, economic development through the Universities and TVET Colleges. 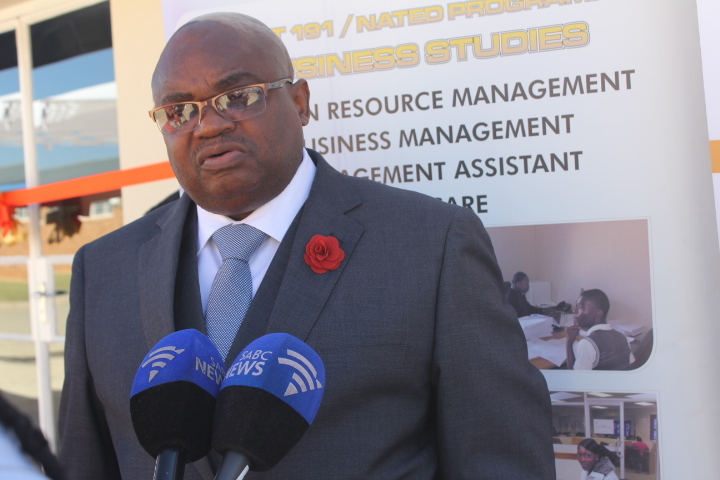 The Centre launched at Goldfields TVET College will make its mark, to contribute towards creating a new pipeline for entrepreneurs, and expectantly serve to reduce the dire unemployment challenges faced by South Africa in the Free State Region. The focus of this Centre for Entrepreneurship will be on the Renewal Energy Sector and their market segment. The market segment for this Centre will focus on designing and manufacturing the Solar Geysers, Installation and Maintenance of the Solar Geysers and the advancements in Innovation and in the Renewable Energies Sector. The College CfE objectives will ensure that incubated entrepreneurs are trained on the required standards and get used to operating within a compliant environment so that when the College students graduate, they are assisted to set up their own similar operations. Goldfields CfE represents one of the Free State Province pilot sites. This Centre will be a feeder into the Rapid Incubation programme, allowing the youth to gain the much needed support and business development services through the incubation programme. In closing remarks, Hounarable Lindiwe Zulu cited that the opening of this new facility is as a testimony of the Government’s commitment to the Renewable Energy Sector and the Department of Small Business Development energy mix objectives to focus on growing the economy of South Africa with small businesses cooperatives. She further put emphasis that township youth in this region need to be trained and supported and that the new generation of cooperatives and SMMEs in the Green Sector should come from townships and the community needs to take advantage and use this site. and forward to NSFAS by courier before the closing date. Please note that applications that reach NSFAS after the 3rd May will NOT be processed. SUPPLY OF TRAINING SERVICES: DEPARTMET OF LABOUR APPROVED FIRST AID LEVEL 1 & 2 TRAINING IN KIMBERLEY. Bidders are hereby invited to bid for the supply of Department of Labour approved First Aid Level 1 & 2 training in Kimberley. * Recent Proof of bank account details with a valid bank stamp. Closing date: 07/04/2017 at 11:00 at which quotations will be opened in public. * No late quotations or quotations per facsimile will be accepted. CLOSING DATE 07 April 2017, applications received after the closing date or faxed applications will not be considered.